Just click to open House Rules by Matthew Kirschenbaum. Short video introduction - box contents and basic rules. English subtitles. The game "Maida 1806: Stuart vs. Reynier" represents a small battle of the Napoleonic Wars. The British army under Sir John Stuart defeated the French troops of Jean Louis Reynier. Outcome of battle was decided by British infantry attack on bayonets, preceded by effective rifle volley. Rules focus on infantry tactics. One battalion is represented by 4 counters. The player determines which order to use at any given time. Various types of orders are represented by different icons. After the change of formation, the players put on the board counter with the corresponding icon. The exception is the square - here we use the auxiliary marker. The battalion can be formed into a column to the bayonet charge or the line to effectively use firepower. The line order is represented by a square and rectangular counters, if a unit was large enough. 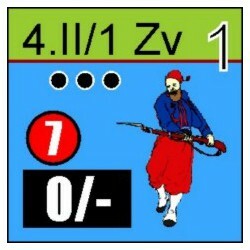 The player can detach a company of tirailleurs, which is represented by a separate counter. The battle of Maida is regarded by historians as an example of the superiority of the British two ranks line over the "classic" three ranks line. This difference is also reflected in the game. Firepower is expressed as a percentage, which depends on the strength. In the case of the British army is 100% - all soldiers can shoot. In the French is 66% - efficient fire through two of the three ranks. For the infantry in column formation or square it is always a 20%. In the case of tirailleurs and artillery on counters are given immediately the effect of fire - a morale check and modifiers for distance, if any. In the battle only two units of the French cavalry took part. They exist in a two-ranks line and because of the tactics used (rapid charge) can not fire. Due to the historical course of the battle, the aspect of command is very simplified. One player draws one commander from a pool (common to both players). Units within its range can move, and further order of shooting is determined (inactive player fires first). Of course, in certain situations very big significance is who will be able to move their troops. The drawing is intended to represent a situation where one of the leaders taking the initiative, and another in spite of favorable circumstances behave passively. During the movement the enemy can react. Units with high morale have better chance that they fire, and maybe even counterattack. However, there is always a risk that our soldiers leave the battlefield in a panic escape. That's what happened to experienced Reynier’s veterans. During the game, the most common procedure is the fire that causes morale check. 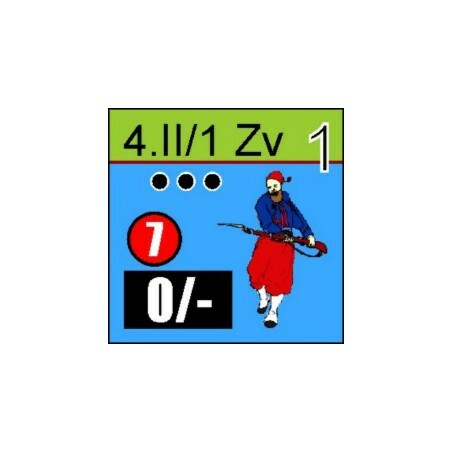 Each unit (except for artillery and commanders) has a proper rating on a counter. The test is successful when a modified roll of a 10-sided dice is less than or equal to the rating. Rule book has 12 pages. Many of the rules describe special situations that can happen during gameplay, for example commander participating in bayonet charge. Basic, most commonly used procedures are very simple. Another advantage is the small amount of counters and a simple overall situation. A challenge for the players is the use of their forces at the right time and in proper order. Experienced players should be enough 3 hours for the entire play.